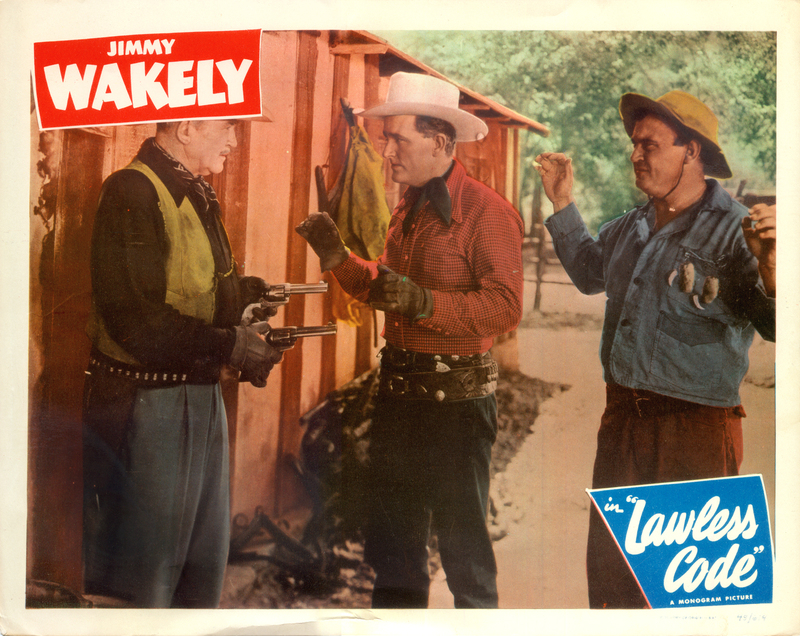 Jimmy Wakely in "Lawless Code"
Lobby card (11x14 inches) for Monogram Pictures' "Lawless Code" (1949) starring Jimmy Wakely and showing the Walker Cabin in Placerita Canyon. "Lawless Code" was the last of a couple of dozen films Wakely starred in for Monogram under a 5-year contract. Monogram production chief Scott R. Dunlap had signed Wakely  a popular Western singer of the 1930s and '40s  in 1944. "Lawless Code" is directed by Oliver Drake, written by Basil Dickey (original screenplay) and shot by Harry Neumann (contract cinematographer on many dozens of Monogram pictures). Stunts are performed by local legend Richard Farnsworth. "Lawless Code" is a bit of an exception from the norm, in that it doesn't appear to have used Hickson's property. Instead it uses the nearby Walker Ranch, which today comprises the bulk of Placerita Canyon State Park. A pivotal scene takes place on the porch of the Walker Cabin, which still stands next to what is now the parking area at the park. LW2242: 9600 dpi jpeg from original lobby card.